The cemetery sits back off a road so green with kudzu that if I stopped moving for long I might be wrapped in it and rooted into Alabama forever. I don’t think I’d mind. A green sign points the way – “Hopewell Primitive Baptist Church.” I pull over on the scant gravel and red clay and curse myself for wearing sandals – this feels like snake territory. At the edge of the graveyard sits a flat white stone, laid across what I assume to be a casket beneath. On top there is no etching – no name, no date – but the stone is piled high with big, plastic floral arrangements. Clearly, the person buried here is loved, so I wonder why her stone is uncarved – religion, expense, a mixture of both? As I wander through the stones looking for my names – Skipwith, Creasy, Nicholas, Randall – I see others I know and remember – Colvin, the 15-year-old girl who refused, even before Mrs. Parks, to give up her seat on the bus; Crispus Attucks, one of the first men to die in the American Revolution. Stones here have collapsed on themselves, obelisks tumbled from their bases. But the grass is cut, and someone brings these flowers. Rural Alabama, or the part I’ve seen on this trip so far, is like a face stripped bare. No mask. No make-up. No fake smile. Just the beauty of a lush landscape and the rawness of poverty. I don’t think I’ve ever spent time in any area this poor . . . or this kind. I don’t know if poverty causes kindness; I suspect it could just as easily cause coldness, but here in western Alabama, people have chosen to be powerfully kind in the face of extreme hardship. 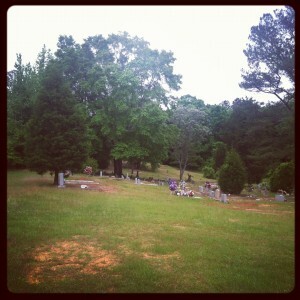 I left Hopewell Cemetery looking for someone who might know the area. A man was just getting his mail across from a tiny, brown house with a neatly trimmed yard and a big oak in the front. I pulled up and asked if he had time for a question. “Yes, ma’am,” he said, and searched his brain for someone who might know the answer. He pointed me to a house around the corner. I shook his hand and drove on, realizing only later that his running engine and his mechanic’s uniform meant I had stopped him on the way to work. He helped me without hurry. The corner house was littered with debris, a children’s lifetime poured on to the lawn and mixed with the neglect of a life hard-lived. A boxer barked his squeak-box woof at me from behind a run-down shed. I knocked. She opened the door, heard my question – “I’m looking for some information about a plantation called Hopewell.” – and invited me in. Right into her living room. She cleared a space on her couch, and while I watched a few minutes of Dr. Oz talking about weight loss, she called at least three people to ask them what they knew. I jotted my address and number on the back of an envelope, and she said when her friend got the information about the church, they’d mail it or drop it here at my hotel. I have little doubt I’ll receive that envelope. I don’t know if poverty can turn a person kind, but if it can, if I can choose that path, then, Lord, make me poor.